U mbragroup, a cutting edge industrial manufacturer based out of Italy, makes a variety of precision spindles. Your Umbra spindle is in expert hands with our factory-trained technicians here at High Speed Technologies, Inc. We have repaired many Umbra spindles to like new condition. Need it fast? Why not take advantage of our Quick Turn Around (QTA) service! All Umbra repairs are also backed by our Warranty and our 30-year reputation of OEM-quality spindle repair. Our customer, a flooring company in the state of Connecticut, sent the above Umbra spindle in because it was getting noisy. One look at the spindle and we could see that it lived a very tough life. The entire spindle body was covered in a thin film of stone dust. The shaft taper looked badly worn and the drive key on the front of the shaft was dented from what looked like several spindle crashes. We also observed some corrosion and pitting but this was aesthetic only. The shaft would not rotate freely. 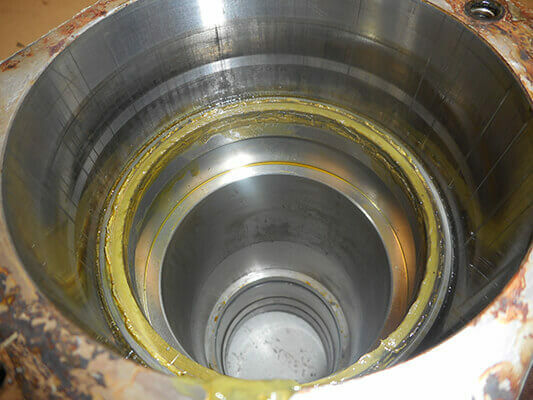 Upon disassembly and closer inspection we observed excessive runout at the shaft taper. This surface required Grind-Plate-Grind to eliminate the runout and establish proper tool to taper ID contact. The rear housing bore also measured small resulting in a very tight bearing fit. We ground this surface open so the bearings would not fit overly tight. Every micron counts! 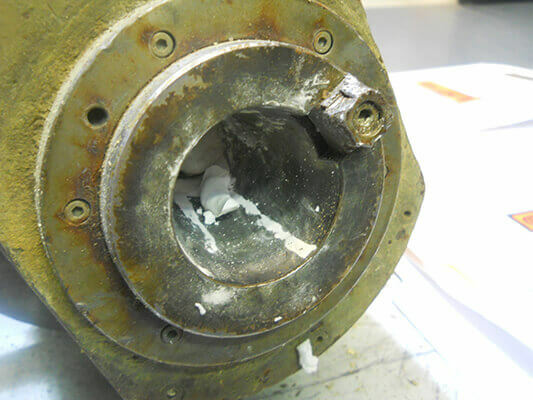 We ground the shaft and housing surfaces on our in-house universal grinder which allowed us to rebuild the spindle very quickly. All bearings, seals and drawbar components were also replaced with new. 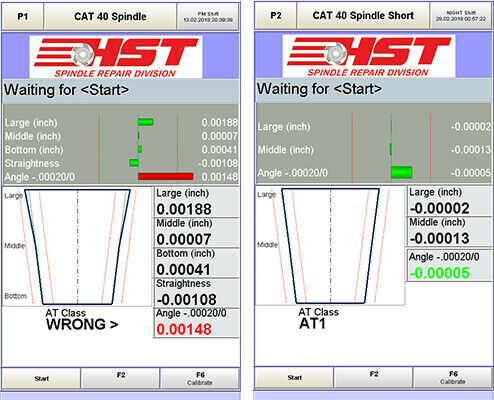 When we received the spindle, the shaft taper ID was extremely worn. The taper angle measured AT Class Wrong on our certified STOTZ air gauge and the runout was terrible at 40 micron or .0015”. After we completed our GPG process the shaft taper was nearly perfect at an AT1 Class and we measured 12 micron at the end of our 300MM certified test bar. And the spindle ran excellent! Housing bore needed to be machined open. For expert Umbra spindle repair, please email or call us at 603-483-0333 for a free, no obligation quote. We offer one-year warranty and Quick-Turn-Around. We are fast, experienced and our work is guaranteed! !